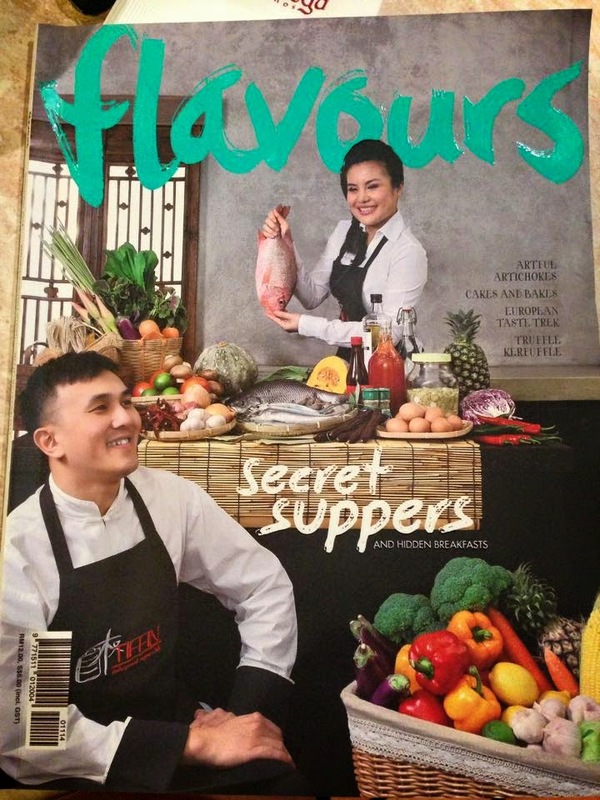 I seldom respond to "strangers" adding me on Facebook, but when Eddy Kwong requested a friend add, I clicked out of curiosity (because we had like a gazillion mutual friends) and discovered he was the person behind Chyuan Tiffin Secret Supperclubs. I've always been fascinated by these clandestine eating outlets, and I (mistakenly) assumed he was a celebrity chef of sorts, and being a sucker I am for glamour and hobnobbing with celebrities, I proceeded with the "Respond to Friend Request". Fast forward a few months, phwahhhh la, the fler REALLY turns out to be a Celebrity Chef of sorts....featured on the FRONT cover of FLAVOURS, our local culinary magazine, and since Flavours is to Malaysia what Martha Stewart Living is to the world, I was getting more and more intrigued by this particular supperclub, and tried unsuccessfully in getting a group together (mainly due to their apathy and lack of interest in responding to my plaintive whatsapp), and was despairing of ever getting a chance to attend. But, bless his generous soul, he invited a couple of us, namely Umei of CC Food Travel and me, and gave us a free hand to invite whomever else we wished, to sample a secret supperclub feast at Chyuan Tiffin. This Tiffin is NOT to be confused with Tiffin in Gardens, which is no secret, and also owned by a friend (who also owns Erawan). Located in an apartment in Sri Petaling, (since it's a private residence, I guess I won't be revealing the exact address here), it feels like a whole new world when you step through the doors. His brother and Thai sister in law are also involved in the supperclub thing, and assist in the preparation. 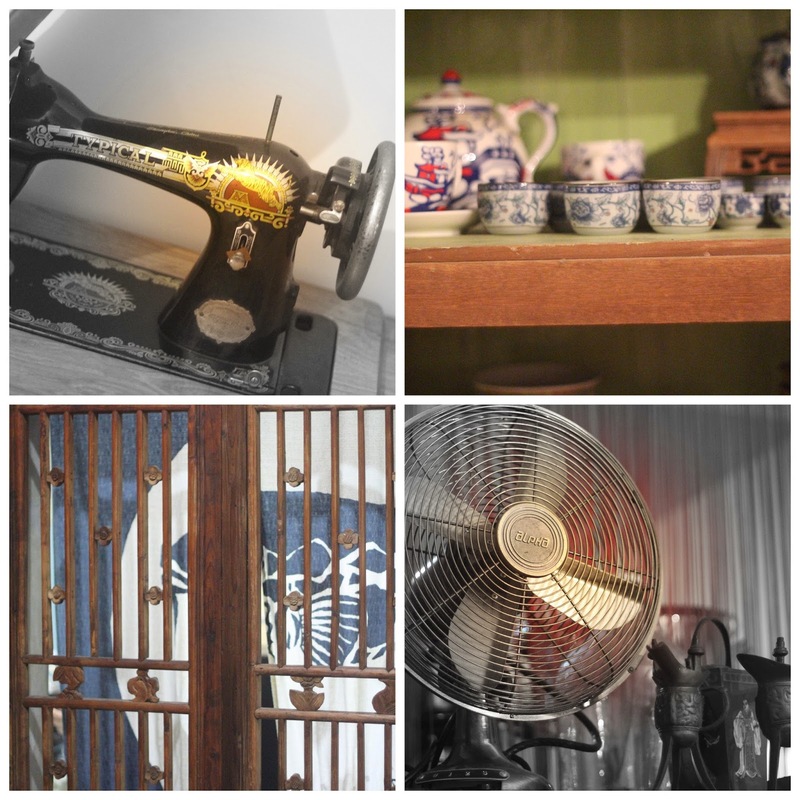 An eclectic array of artifacts reminiscent of days gone by adorn the apartment, mainly with Peranakan inclined style, and of course, as the namesake goes, a variety of tiffin carriers. To start, a piping hot clay cauldron of Tom Yum Gung soup, to warm the heart and soul, and tummy, as it was a rather rainy cool day...clear (as in not thickened with coconut), tangy, spicy and really packing a kick for those who like their food spicy. When another Chef goes gaga over the preparation of another chef, that is high accolade indeed, as David Looi of M.A.D. expresses his admiration for Eddy's stuff. To complement the tom yum these elegant parcels of mee hoon, (Rice Vermicelli) in convenient nests swirled and topped with garlic. 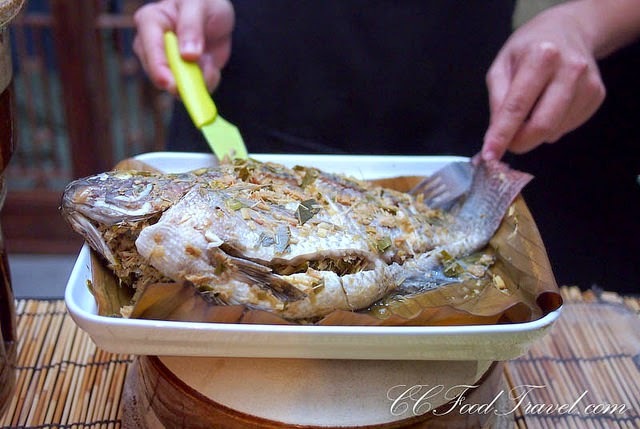 This traditionally Thai style steamed Tilapia is served with the lettuce and platter of other herbs, with a fabulous spicy green pestolike sauce that results in what feels like an hour's workout in terms of the perspiration acquired by partaking of this dish. As I was too busy having a tipple or two, and taking human pictures, I totally did not have a picture of this fish, so am unashamedly lifting it off CCFood Travel.com....So sue me. Sweet and Spicy Prawn Salad, I guess this was meant as a starter, but since everything was laid out, we ate the stuff in no particular order. The contrasting flavours of sweet, spicy and sour makes this dish excellent with white wine actually. Although I was really looking forward to his famed SIU YOKE, (Roast Pork), apaprently there were not nice cuts in the market so we did not have a chance this round. (anyway, Chef Dave Looi liked the place so much, he says he wants to have his birthday here on the 20th Feb 2015, so hopefully we'll get the Siu Yoke then). We had this rather delicious Pork Neck Cucumber salad though. Basically, at every turn, a new flavour shows up to assail the palate. And for dessert, (I didn't know this was dessert and actually had this first), Homemade (obviously) Santan Marshmallows. I am generally not a fan of marshmallows, nor its texture, but these were different, and the fine balance of textures and sweetness actually makes you want to have more than one. The slight saltiness presumably from the grated coconut also adds the the interesting cornucopia of flavours. A dinner like this would cost RM75 buffet style. A sit down dinner is also possible for crowds of 6 or less. 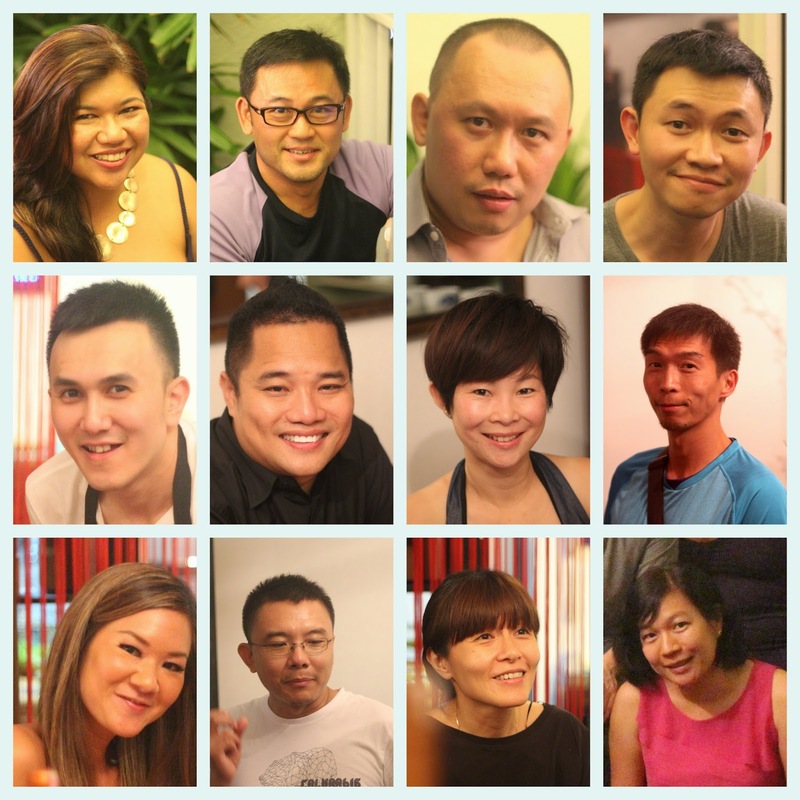 To book check out and LIKE their FB Page HERE, or search Chyuan's Tiffin Underground Supperclub. Thanks muchly Eddy, we will be back soon. Actually almost annually, we have a family picture at the lobby of Shangri-La KL with their Christmas tree, which is always quite grand. However, this is the first time I've been present to witness the lighting of the tree, and this year was a rather unique tree too, if I may say so. The theme of this year's tree (I didn't realise trees had themes) was Merry Nutcracker Joy Ride. Amazing works of crafted sugarpieces of Nutcracker soldiers and trains are stacked up on a conical steel structure to form the 12-foot-tall Christmas Tree. Quite a joy to behold....even before it was lighted up. The event was preceded by High Tea at Lemon Garden, unbeknownst to me, the event was a charity, to raise funds for 10 children with severe heart ailments, and also as a treat for over 100 disadvantaged children from Tasputra Perkim and Pusat Penjagaan Kanak Kanak Cacat Taman Megah, and children from the UNHCR (United Nations High Commissioner for Refugees). Incidentally, The sugarpieces are for sponsorship by donors, each for a minimum donation of RM1,000/-. The donors’ names or company logos will be prominently displayed against each sugarpiece. And the tree is lit...and the trains go round and round!!!! How I've never observed that a new establishment called SIX had opened just above Creperie la Caroline is really quite beyond me, as I ply that route nearly EVERYDAY, which really makes a case for ground floor rentals. Nevertheless, I was intrigued, by yet another F&B outlet, or rather, as I was to discover, just a B outlet, as the F is virtually non existent for now. Described by the lovely Ann as "An Adult Playground"... Six is actually a cocktail bar with the most smiley mixologist I have ever seen, Imran, who exudes such passion in his Chemistry that one cannot be contagioned by his enthusiasm. To start, A 6 Hit Wonder. Tequila done differently. An aged tequila is infused with lemongrass and kaffir leaves, together creating a fresh clarity that sings throughout the drink, while viscous Vermouth, and Aperol add body and depth to this beverage. Sweetened with organic agave nectar, balanced with SIX house bitters. To start, I thought this was a refreshing cocktail, almost with a healthy taste to it, with a slight bitter tinge, which I liked. 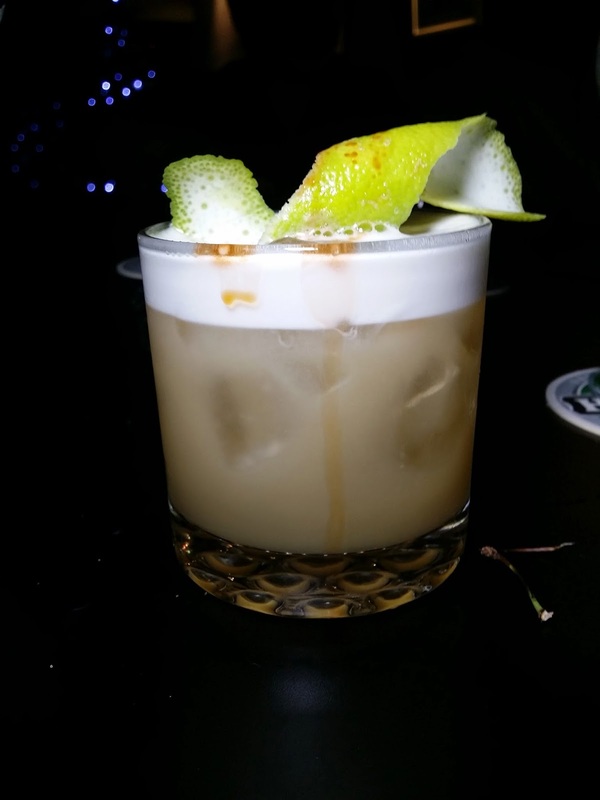 I asked why bother with organic agave nectar, it's not as if we're going to be reaping the healthy benefits, but the simple answer was, "the taste"....Okay, if I thought that all cocktails should be more aptly called pussytails... I was wrong. Ta dah, the SIX HIT WONDER. That glorious colour is almost enough to make me happy. Next was Commodores 6 Times a Lady, or if you're slightly younger, Lionel Richie. I guess over the years the lady must have err.. gained some..
concoction -not to be ignored. By the way, the Italics imply that it's cut and pasted from the press release. When the press release contains words like seduce and tease, I think it's no point reinventing the wheel. Okay, truth be told, I am not a fan of white colored drinks, because I have a psychological thing about lactose and alcohol.... although in this case, there really is no lactose, and the white is from coconut. The erect screwpine leaf might be symbolic of something, I'm not sure. First batch of 6 Times a Lady. At this point, I think, it was when I asked Ann, why no SIX SIX SIX ah? She promised to make sure there would be one named after me. What did I say about the smiley guy??? Thinly almost mandolined slices of cucumber as is the natural partner for Hendricks... is used as a garnish, and no doubt to give us some roughage and fiber.. This Back to Square 6 is my favourite, though honestly, I am not too enthused by the name. But until I can suggest a better one, I better shut my gab. Ann the two of SIX dashing owners. (and I actually mean 6 number of owners, or at least that's what I think I heard). I actually sounded like I was trying to pick up Lester (far right) when I asked him what scent he was using, because it smelt so good. It was Issey Miyake. Make mental note to buy at DFS. What's this??? Truffle? Vodka??? Wow, truffle infused vodka. 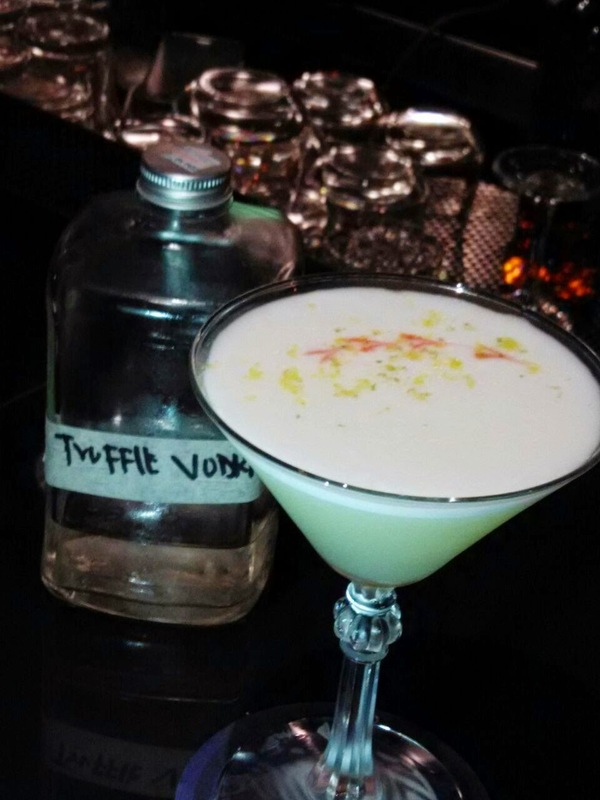 and luxurious texture to this simply divine concotion -served up, Martini style. rich fruity flavoured concotion to the table. Served over an aromatic apple and lavender. But on the other hand, it contained Single Malt wor, (he used Glenfiddich instead of Singleton), and I have NOOOO idea what a SIX PEDRO XIMINEZ is. As a bonus, for being such nice people, we were treated to home made mince pies, made by baker extraordinaire, Ann, who has been aging her mince for A YEAR, with XO!!!!! Seriously LARVERLY buttery pastry that melts in the mouth and mince that isn't too sweet.... AIKS, is it Christmas ALREADY??? Well, according to the next and final cocktail, it is!!!! infused with a beautiful blend of spices – cinnamon, nutmeg & cloves. Circumcising the cherry rather than popping them... he gently places one on the rim of each glass.. The egg nog cocktail I have to say, really went well with those fabulous mince pies... One almost felt compelled to go HO HO HO all the way home. tarik, but with Guinness instead! SIX promises to provide a different experience every night, but always a good time! Bar. Opens every day except Monday, 5pm – late. I have to say I thoroughly enjoyed this cocktail bar, and will certainly be back with my cocktail loving friends.